Griffin Park has been home to Brentford Football Club ever since it was built in 1904. The ground sits in a heavily residential area and, rather charmingly, has a pub on each corner. The name Griffin Park comes from the fact that the orchard on which the stadium was built was owned by Fuller’s Brewery who featured a griffin in their logo. Undersoil heating is not in existence at Griffin Park and leaves the pitch open to the elements. That pitch is also a natural grass surface and measures 100 metres by 67 metres. 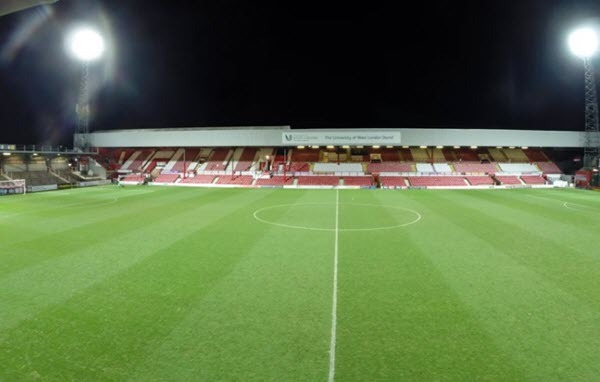 Brentford’s current capacity is just 12,300 and while it would be relatively simple to extend this, no more work will be done on Griffin Park. Griffin Park, with all its charm, is made up clockwise from the north of the New Road Stand, the Ealing Road Stand, the Braemar Road Stand and the Brook Road Stand to the west. None of the corners are filled in and in fact the Brook Road Stand does not quite fill the width of the pitch. Away fans at Brentford are given space in the Brook Road Stand which sits in the western part of the stadium, behind the goal. There are two tiers and an allocation of 1,600, the top tier seating 1000 people and the bottom accommodating 600 fans in a terrace. Although many fans reliving their past prefer to stand on the lower section, the terraced area, sadly this area offered restricted views for some fans due to support beams in the structure. The atmosphere inside the ground and the friendly nature of the club both come through on matchday and has led to very positive feedback from most visiting groups. Standard adult single ticket prices for Championship games are split into Category A and Category B games, these depending on the level of opposition and the time of year. Tickets for the former range from £25 to £30 and for the latter £23 to £28. Concessions are offered around the ground for juniors, seniors and the disabled. Corporate and hospitality guests at Griffin Park are entertained either in the Legends Lounge or the Boardroom. Prices in the former tend to be around £150 per person, per game plus VAT while in the Boardroom they are £216 plus taxes. All guests can expected special treatment ranging from welcome drinks, a pre-match meal, half-time refreshments and a comfortable seat with the best views in the house. Griffin Park sits in the heart of west London, right near the north banks of the River Thames and around 7½ miles from Westminster. As always with stadia in London; Griffin Park is best reached by public transport with the train being the best option in this case. Brentford train station sits just a 5-minute walk from the ground with trains connecting via Waterloo station. Alternatively the Tube on the Piccadilly Line can take you to South Ealing station which is around a 20-minute walk to the stadium. Griffin Park as it turns out may not be the long term home of the Bees. In October 2002, Brentford FC announced their plans to move to a 20,000-seater stadium near Kew Bridge, close to their current home. Years of negotiation went by however without ground being broken. In August 2017 though it was announced that work would start on the new development in 2018, though now with a lower capacity of 17,250 and as a groundshare with rugby union side London Irish. This entry was posted in Championship Teams and tagged Brentford, Griffin Park. Bookmark the permalink.